The younger generation of card magicians probably knows or has heard of Card College by Roberto Giobbi. The Royal Road to Card Magic is very similar but of older vintage and doesn't cover as much ground. It introduces the novice into the art of card magic one move and principle at a time, always with tricks accompanying the moves. It is therefore not a mindless list of moves but a well prepared and thought out textbook. It will take the beginner to an intermediate level. Once The Royal Road to Card Magic has been mastered one can move on to Expert Card Technique which requires a higher skill level. 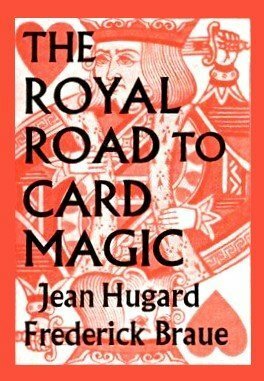 Actually because Expert Card Technique did not sell well when it was originally published in the 40s, Hugard and Braue wrote The Royal Road to Card Magic to provide a stepping stone to the much harder and less accessible Expert Card Technique . I can't accurately express how important this book is for a card magician. This book will teach all of the basic techniques for cards. This includes False Shuffles, Double Lifts, Hindu Shuffles, The Pass and many more. Along with the techniques you will find tricks that use the handling you have just learned. If you really take the time to learn all of the techniques, as well as some of the tricks you will be better than most amateur card magicians.